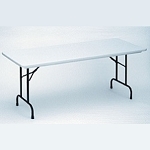 Correll Folding Tables - R3096 Blow-Molded Heavy-Duty - 30 in. x 96 in. Table Top. The Correll R-Series folding table is a commercial-grade, heavy-duty product. 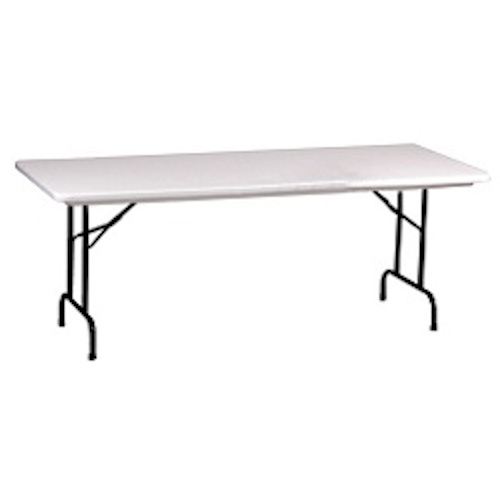 The R3096 features a 30" x 96" table top. The frame on the table is made of 18 gauge steel. The blow-molded top resists stains from just about anything, including: paint, food, permanent marker, and other chemicals. The plastic table top is virtually indestructible and resists damage from gasoline, paint remover, battery acid, and drain cleaner. These folding tables are excellent for home or commercial use. As a banquet table, and 8 ft. table seats 8 adults comfortably. Light weight, waterproof, and virtually indestructible one piece Blow-Molded Plastic Top. Resists damage even from Gasoline, Paint Remover, Battery Acid, and Drain Cleaner. Table Top measures 30 inches wide and 96 inches long. Choose a table top color of either mocha granite or gray granite. Table top uses a 1 1/4" skirt clip. Strong Steel Ladder Frame under the table top for added support. 1", 18 gauge steel Pedestal Legs built for heavy-duty uses. This table looks great with RC350 Correll Folding Chairs or RC600 Correll Folding Chairs. Quick-ship product from Correll will typically leave the warehouse within 1-3 business days. Product generally ships via an LTL freight carrier, which usually takes 3-6 business days in transit time. Table weighs about 54 lbs. Comes with a 5 year factory-honored warranty from Correll. Competitive Edge Products will try to match or beat any online competitor's advertised price (price of the product + any shipping and handling costs) for the same model R3096 Correll Folding Tables. Q: Is this table adjustable? A: This table is fixed height-not adjustable. Shipping on In Stock Items: Orders for the Correll R3096 generally leave the warehouse within 2-4 business days. Dimensions: 97" x 31" x 4"